The Gefen EXT-DVI-FM1000P DVI Extender uses two small transceivers to extend any HD source using DVI source to a monitor or HDTV display up to 3300 feet (1 km) using one OM3e/OM4 multimode fiber optic cable terminated in an SC connection. Automatic EDID Programming enables quick integration of the HD source to the display. The optical signal transmission provides immunity from electromagnetic interference (EMI). The Sender module plugs into the HD source. The Receiver module plugs into a monitor or HDTV display. A single strand of multimode SC-terminated fiber optic cable connects the Sender Module to the Receiver module. The maximum length of the multi-mode fiber optic cable will vary based on cable type. Note: Only the Receiver module requires an external power supply. The Sender module receives power from the HD source. 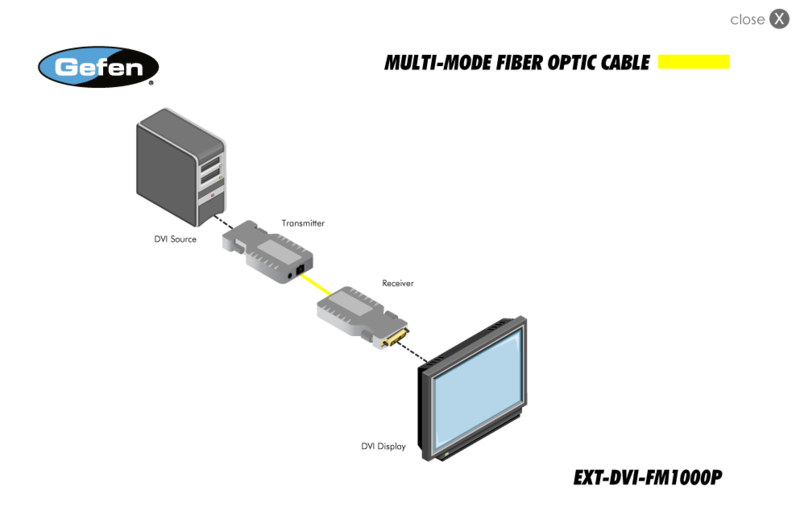 The Sender module may need an external power supply if the HD source does not supply enough power through the DVI connector.